Admiraal (Emerald J x Haniyyah) winning at Aachen in 2018. Hexe (Siglavy Bagdady VI-8 x Jowziah) at Ostenfelde in 1978. 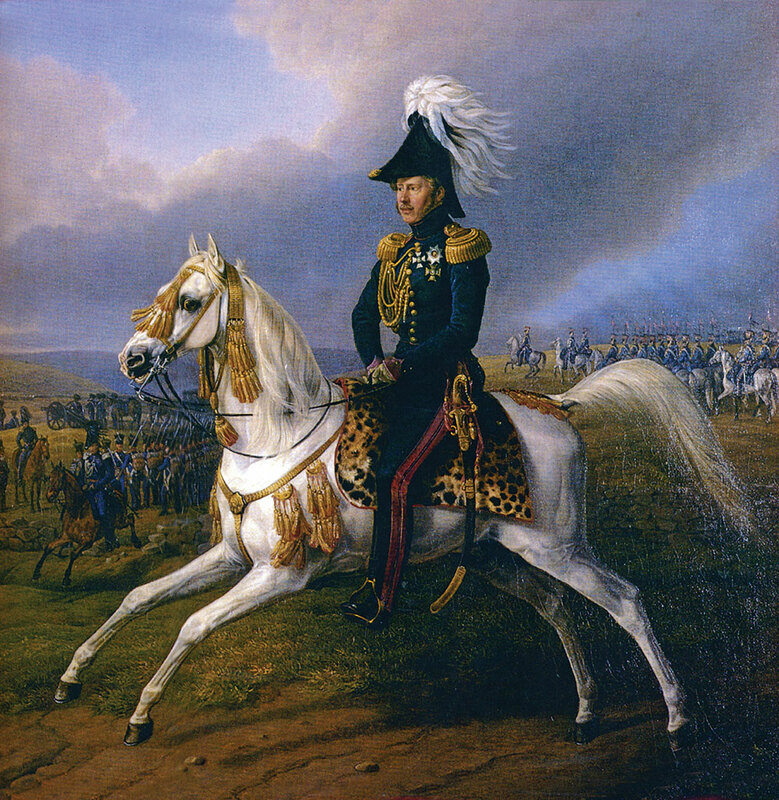 King Wilhelm I of Württemberg, who imported the mare Murana I in 1816, riding his Arabian stallion Bairactar. It’s funny how things repeat themselves. Around a year ago in the March, 2018 issue, I wrote about a yearling colt, HL El Ganador (HP Shakir Te x Lonco Baby Maria), who won numerous international gold titles and turned out to be descended from a mare I used to know and from a very old and special family. Guess what: something very similar happened this year. The yearling colt everyone talked about in 2018 is Admiraal. By Emerald J (by QR Marc out of Emandoria) out of Haniyyah (by Psytadel), he conquered the rings at the All Nations Cup, the European and the World Championships to win the coveted Triple Crown. He is owned by Ajman Stud of the UAE and was bred by Al Muawd Stud of Saudi Arabia; both his parents come from Belgium, and he himself was born in Britain, making him a very international individual. As for his breeding, if you look no further than the parents and grandparents (all of them champions themselves), the bloodlines are pretty much what is en vogue today. But, being traditionally minded, I took a closer look at his pedigree, and in particular at his dam line. What I found, swept me back instantl,y over 40 years in time, to 1978. It was my third visit to the Ostenfelde Stud. 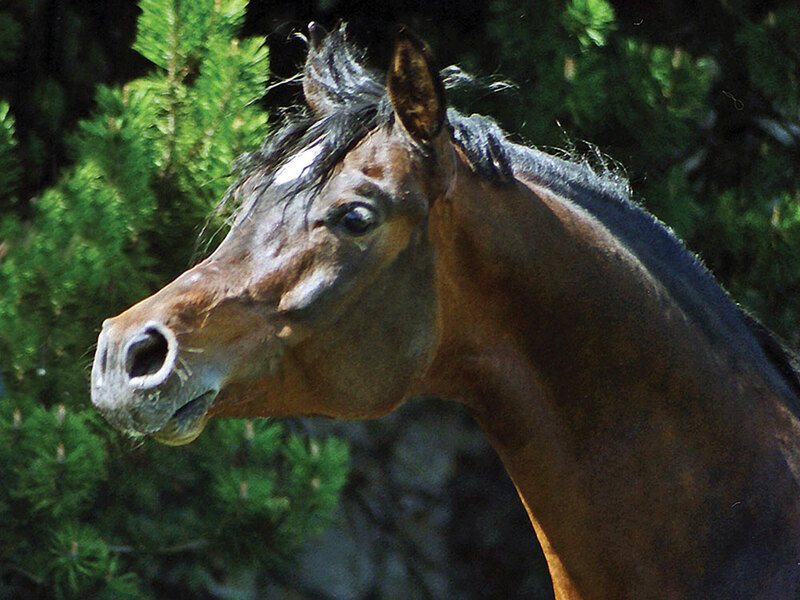 Founded just a few years earlier, Ostenfelde was to become the biggest Arabian stud in Germany for many years, with a huge herd of Polish mares that eventually earned it the name “Little Janow.” But that was still in the future. The original breeding program was more diverse, incorporating traditional old German and Egyptian bloodlines. From 1976, I visited Ostenfelde every year, usually during the annual open day, when all the new foals were inspected for registration and, along with their sires, presented to the public. 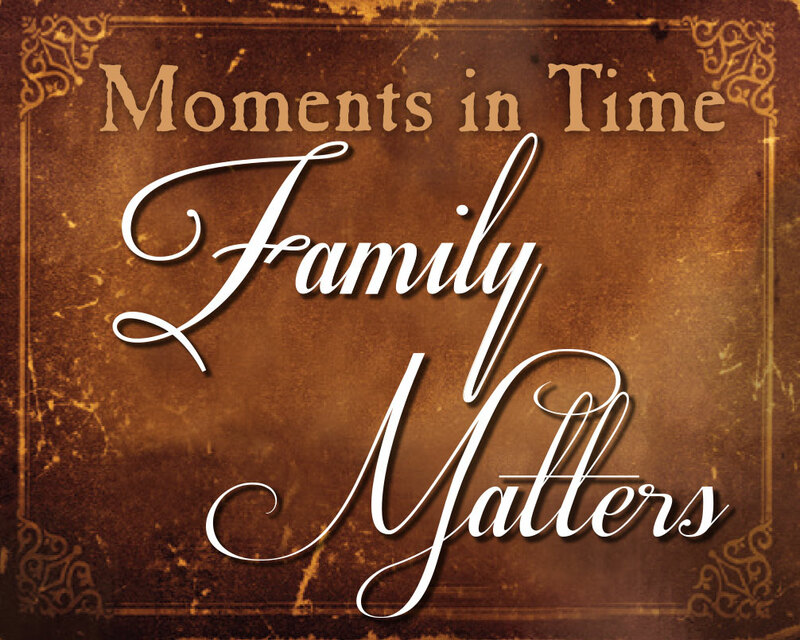 People used to come from near and far to watch; it was a great occasion to see old friends and make new ones and to introduce your kids to Arabian horses. In later years, I got to name the foals (there were a lot of them and the owners were running out of ideas). It was a date to look forward to each year, until, sadly, the stud had to be disbanded in the 1990s due to the owner’s declining health. But let’s return to 1978, which was before all that, still in the early years. Among the horses I saw on that occasion was one that stood out, a pretty five-year-old grey mare named Hexe (Siglavy Bagdady VI-8 x Jowziah). “Hexe” is German for “witch,” and she really was bewitching: very typey, with a beautiful head, a great trot, and a tremendous style that made her stand out. If she was born today, she’d be headed for the show ring; but there were hardly any shows back then, and she never was shown. The filly she had at foot, her first, had that same style and “look at me!” attitude. 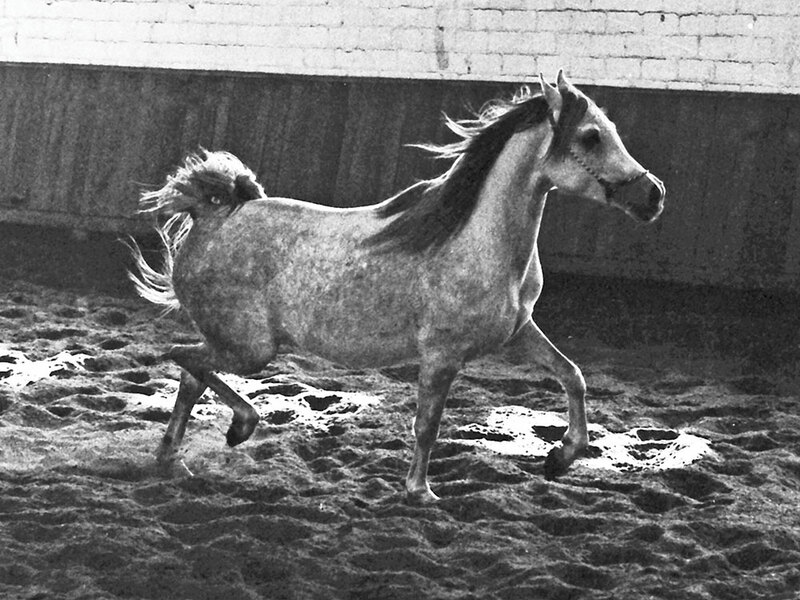 Hexe’s breeding was pretty special, too, because she was from Achental Stud: the first private Arabian stud in Germany after the War, founded with horses from Hungary and Poland that had been stranded in Germany after the War and were rescued and identified by a lady called Gertraute Griesbach. The same Achental Stud, in fact, to which HL El Ganador traces in his dam line. Achental closed down in the mid-1960s, but Mrs. Griesbach’s daughter, Dr. Irmelin Fenner, emigrated to Argentina, took some of the horses with her and bred them on. That’s where Hexe came from, with a pedigree consisting largely of old Hungarian and Polish breeding, including three crosses to Wisznu, the *Witez II son who was Achental’s chief sire. Her dam line, however, traced through one of Mrs. Griesbach’s Marbach-bred foundation mares, Joschi, right back to Murana I. For those of you who don’t know this, Murana I (foaled in 1808) was the desertbred mare with whom King Wilhelm I of Württemberg founded his royal stud at Weil in 1817. It is the oldest existing dam line in the Arabian breed that can be traced straight to the Desert. Since Ostenfelde soon changed to breeding pure Polish horses, Hexe didn’t stay very long. She had only two foals there: the filly I saw in 1978, by the U.S.-bred Blue List stallion El Beshir (Faaris x Sirrulla), and another filly in 1979 by Ostenfelde’s new Polish stallion Euben (Bandos x Eunice), a full brother to Michalow’s chief sire Eukaliptus. The El Beshir filly, Helaah, became a foundation mare for a German preservation breeder and founded a family of great athletes for him. 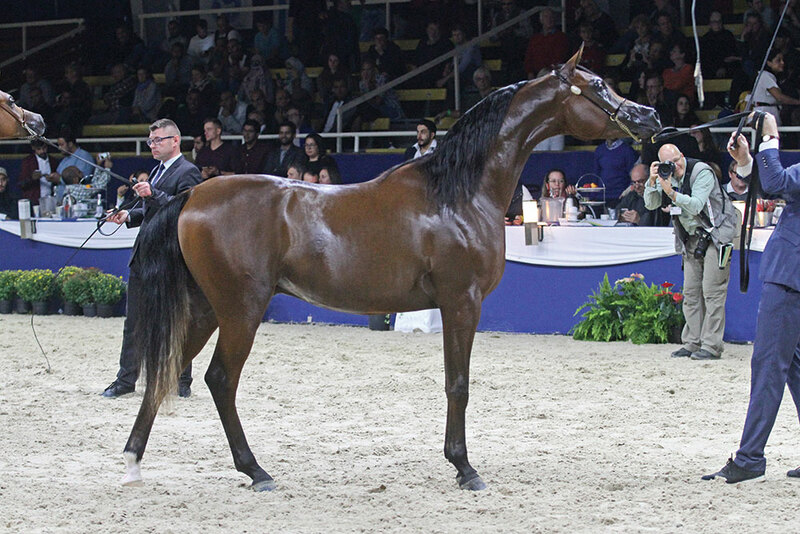 The Euben filly, Hamira, was exported and became a foundation mare for Nejdi Arabians in Belgium. Hamira was a superb broodmare, producing highly successful international offspring by the prominent sires of her time: the stallion N.A. Colt by Warandes Plakat, exported to France; N.A. 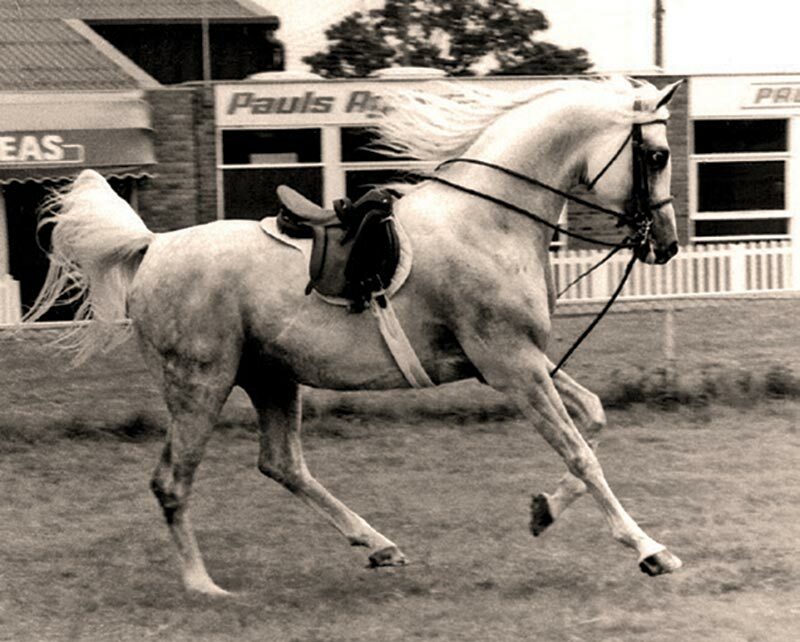 Erotika by Warandes Pascha, a top broodmare in Britain; and, best of all, N.A. Divina by Amal. N.A. Divina had three daughters by Warandes Plakat, of which La Diva, an international champion in her own right, is the dam of British National Champion and sire of champions, Psy Dream (by Psytadel). The oldest of the three sisters, Hanina, was also exported to Britain, along with her filly Haniyyah by Psytadel. A full blood sister to Psy Dream and great-great-granddaughter of Hexe, Haniyyah was a very successful show filly in Britain. She went on to become an equally successful broodmare, producing the British National Champion Stallion Designed and, in 2017, Admiraal, the reigning ANC, European, and World Champion Yearling Colt. So there we have it: a thoroughly modern colt, but also the heir to a long and rich history, tracing directly back to the oldest dam line of all: Murana I, the mare owned by a King who founded a truly royal dynasty. For me, this is one of the many wonderful things about Arabian horses. Yes, they are beautiful to look at, but they are so much more than that. Not just pretty pictures, but living history books whose pages contain stories of everything you can imagine: war and adventure, love and loss, excitement and heartbreak. 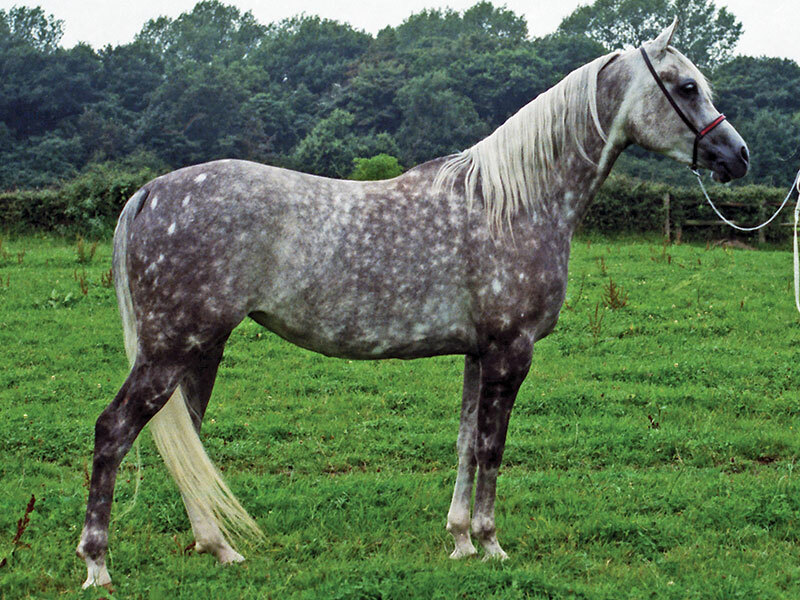 In the past, the Arabian was the mount of warriors and the companion of kings. As alluring as the bright lights of the show ring and the thrill of winning may be, let us never forget the proud heritage of which we, today, are the guardians.